1. I am using the beautiful art of Barbara Jensen HERE ., or use tube of choice. 3. Mask # 5 by Doris at Scraps Dimension or use mask of choice. Note: This tutorial and kit were originally released April 10, 2011 and was updated today on March 19, 2017. 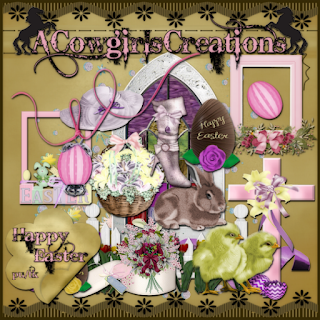 I have put two examples of tags made with this kit using Barb Jensen's art, the tutorial will work with either tag version thanks to the versatility of this kit. If you want to use the second version, just substitute the mesh , use chicken wire instead .... and put some flowers in the background. Drop shadow settings : Vertical 2, Horizontal 1, Opacity 100, color black, shadow 4. 1. Open a new file in PSP, size 600 x 600 pixels, tick transparent box. Change f/g and b/g colors in materials palette to #ed7ec4. Use paint bucket tool and flood fill file. Open SD mask # 5 . Layers> new mask layer> from image. Copy and paste newly created image onto flood filled file " as new layer" :> layers> merge visible. Delete original mask. 2. Open mesh from kit. Get pick tool on left tool palette. Push inward on each side by about 2 blocks. 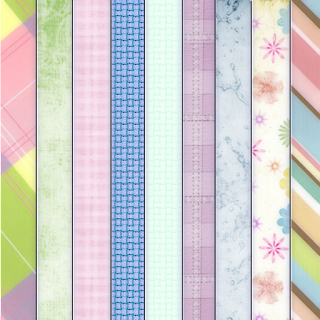 Copy and paste onto tag " as new layer:> layers :> merge visible. 3. Open ribbon 2 from kit. Copy and paste onto bottom of tag " as new selection" and position centered, about an inch or so from the bottom of tag > effects> 3D effects> drop shadow. Selections> none. 4. OPen a new image in psp , same as step one. Open stained glass window from kit. Image > resize to 85%. Adjust > sharpen. Copy and paste window on left side of file as shown " as new selection" and paste again on right side of tag " as new selection so that windows are side by side. Selections> select none. Effects> 3D effects> drop shadow. Copy and paste onto tag " as new selection" > selections> select none. 5. Open Cross from kit. Image > resize to 85% > edit > repeat resize twice more. Adjust > sharpen. Copy and paste onto center of windows " as new selection" , position as shown. Effects>3D effects> drop shadow > selections> select none. 6. Open picket fence from kit. Copy and paste onto tag :> as new selection> , position as shown so that tulip bottoms match window bottoms > effects. 3D effects> drop shadow> selections> none. 7.. Open ric rac 1 from kit. Image > resize to 85%. Edit > repeat once more. Image > adjust > sharpen. Copy and paste onto bottom of fence " as new selection", position as shown. 8. Open chicks from kit. Image > resize to 85%. Edit > repeat resize twice more. Adjust > sharpen. Copy and paste onto lower left side of fence as shown> effects> 3D effects. Drop shadow> selections> none. 9. Open Barbara Jensen tube or tube of choice . Copy and paste onto tag " as new selection" >: position as shown> effects>3D effects > drop shadow. Selections> select none. 10. Image > resize tag to 90%. Adjust > sharpen. Add proper credits to tag and save as PNG file. Thanks for trying my tutorial . Tag and tutorial were created by me 4/9/11 and both are solely my creations. . Do not copy or reproduce or claim as your own. Do not post to any website, blog or forum without my permission . Do not hotlink. Do not translate.